This demo surveillance video illustrates the HD resolution capabilities of the HD-Q7 1080P HD security camera in both day and night applications. The HD-Q7 is a High definition security camera with built-in infrared night vision. This is a hybrid-type security camera that supports 4 video modes. Installers can easily select AHD, HD-TVI, HDCVI, and analog CCTV video modes using the small joystick that is attached to the camera's video cable. This video surveillance footage seen here was recorded with the HD-Q7 connected to an iDVR-PRO recorder. The camera is running in 1080p AHD video mode. Initially, I have all of the lights on in the room so that viewers can see the high-resolution color day time image that the camera captures. When I switch the lights off, the camera’s infrared LEDs turn on and the IR cut filter is engaged. This infrared night vision mode is automatically engaged when light levels are low. After I turn off this floor lamp, there will be zero light in this room. The camera is relying on its built-in infrared technology to capture this video. I turn the floor lamp back on so that I can see my way back to the light switch. When I turn the light back on, the infrared mode is disengaged and the camera captures color video again. The HD-Q7 is a hybrid infrared security camera with 4 video modes. 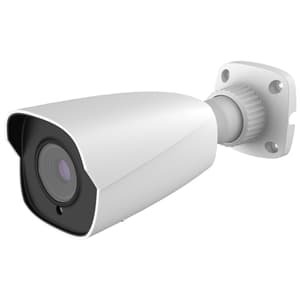 This camera supports 960H resolution when running in analog CCTV mode and 1080p resolution when it is run in AHD, HD-TVI, and HDCVI video modes. The weatherproof housing makes this a great camera for indoor or outdoor installation and the trick-axis mounting bracket supports ceiling or wall installations. To learn more about this camera, please visit www.cctvcamerapros.com/Q7. Thank you for watching. Click here to learn more about the HD-Q7 1080P HD CCTV Camera used in this video.